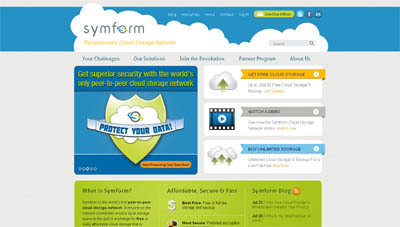 Symform is a new cloud storage and backup service. The main idea is simple: give local storage, get online storage. Symform disrupts the traditional model of cloud storage and backup by utilizing excess local storage across its customer network. You contribute local hard drive space in exchange for fast and reliable offsite backup. It’s a win-win situation! For contributing storage, you get up to 200GB for free, and unlimited storage is available for a flat fee. When even one event of data loss can severely damage a business, local backup is not enough to protect company and customer data. Unlike data center storage, Symform encrypts, shreds, and geo-distributes data across a global network. The result is Symform‘s network is the fastest, most secure, and lowest cost cloud storage and backup solution available.